We offer a complete installation service with our own in-house installation teams. We have a highly skilled professional installation team who really are the best and most knowledgeable team you are ever likely to find. We can offer a complete installation service, from removing your existing fireplace to installing your new pride and joy. If you live in the South Wales area and would like a free of charge, no obligation site survey, please feel free to contact us on 01443-408548 or follow this link. 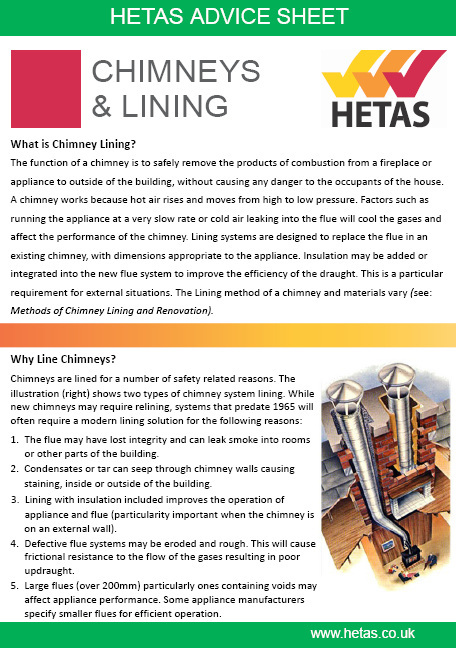 Our installation team is trained and qualified with HETAS (Solid Fuel) and Gas Safe Registration. After installation is complete we will supply you with a formal installation certificate. This certificate should be retained and kept safe as it may be important should you wish to make a claim on your household insurance. 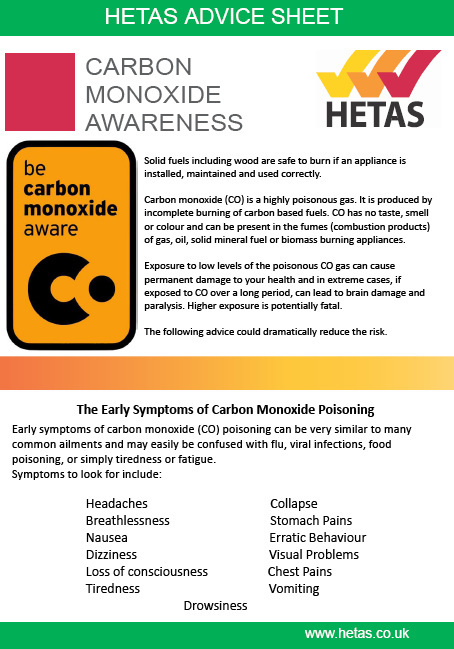 With every solid fuel installation, we are also required by law to install a Carbon Monoxide alarm in the same room as the appliance – a) On the ceiling at least 300mm from any wall or, if it is located on a wall, as high up as possible (above any doors and windows) but not within 150mm of the ceiling; and b) between 1m and 3m horizontally of the appliance. 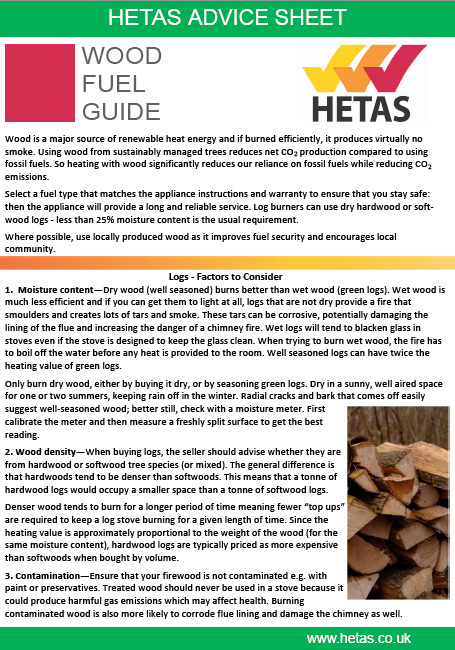 Customers using a HETAS Registered Installer will be given a HETAS Certificate of Compliance by the installer on the completion of installation work. This is vital importance in demonstrating that the installation was carried out by a competent installer working for a HETAS registered business and complies with the relevant Building Regulations. The information on the certificate is used to record your installation, and in England & Wales it is used to notify your Local Authority Building Control Department (LABC) of the work that was undertaken. This 'self certification' by competent registered installers takes the place of a Local Authority Building Notice which could cost you a significant amount of money (sometimes up to £300). 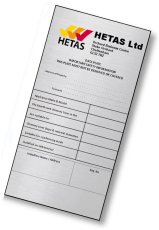 The HETAS installer is charged a small fee by HETAS for this service, but much less than the charges incurred if you seek a Building Notice via the Local Authority. The information is required to validate household insurance and will be required by Solicitors in any home selling process. Failure to notify the Local Authority (the process differs in Scotland), can be an offence resulting in enforcement action being taken against the Householders and/or the installer, this could cost anything up to £5000. 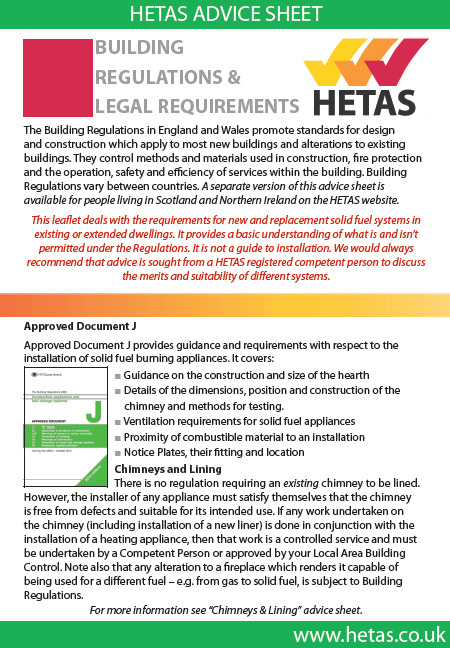 The Certificate of Compliance must be completed and signed only by the HETAS Registered Installer who undertook the work. 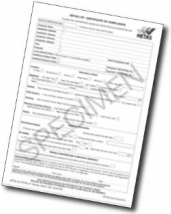 The white copy of the fully completed and signed Certificate must be returned to HETAS Ltd at the address shown at the bottom of the Certificate within 7 days of the completion date of the works. HETAS will then process the information provided on the Certificate for submission to the relevant Local Authority within 30 days of the completion of the works as required by the Building Regulations (a legal requirement). 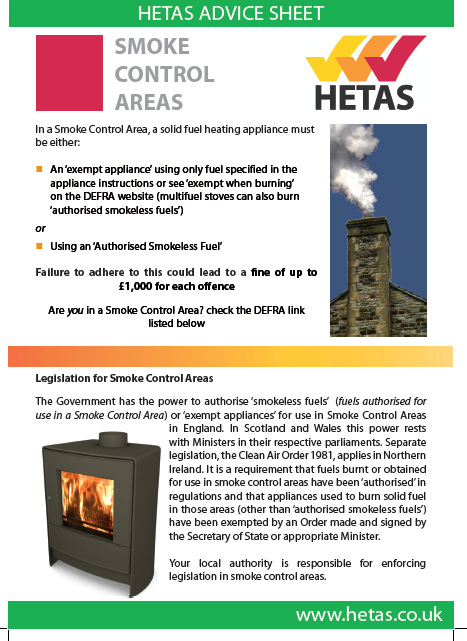 If the HETAS Ltd Certificate of Compliance is not provided, is not completed correctly or the Certificate is returned late then there will be no notification of the work to the Local Authority by HETAS. This would in fact mean that the law has not been complied with and can cause difficulties when selling a property and potentailly void a household insurance policy. 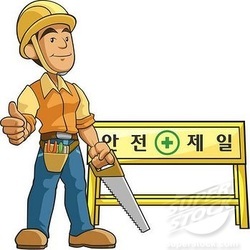 Where a hearth, fireplace, flue or chimney is provided as part of the work information essential to the correct application and use of these facilities should be permenantly posted in the building. A way of meeting this requirement is for the installer to provide a Notice (or Data) plate, such as the sample below.